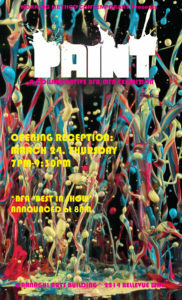 The opening for PAINT will take place on March 24th from 7:00-9:30PM! Description of the Exhibition: “Painting is a dead-end creative practice with endless possibilities.” Despite its rich, complicated past and uncertain future, there are still many artist who continue to work obsessively and passionately with this age-old medium. This night is a celebration of all things “paint”: traditional, experimental, abstract, representational, maximalist, minimalist, 2D, and 3D. All manifestations of this medium are welcome. The exhibition is open to all MFAs and BFAs. The only criteria for submitted work is the use of paint in some way, shape or form. 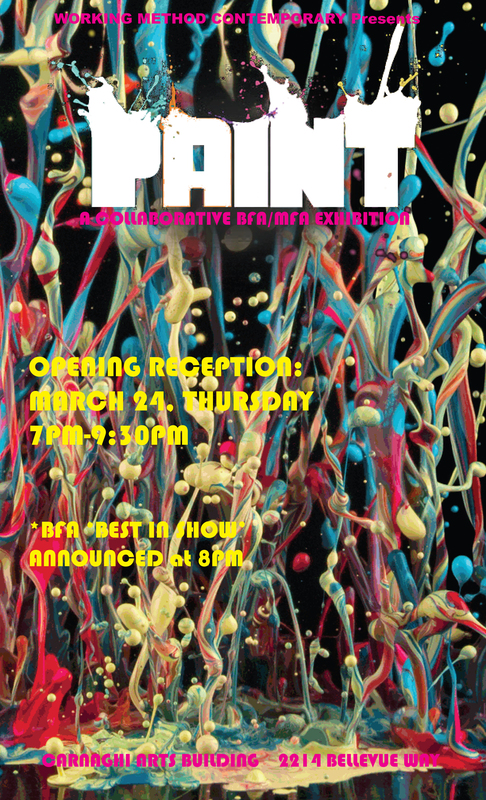 It will be a juried show for the participating BFAs, and the “Best In Show” will receive a prize, which includes a huge goody bag of art loot from Utrecht. Please email a quick pic of your work (up to two) to Michelle Eccles and include your full name, title of work(s), date of completion, materials used, size of the work(s), and any special directions for installation by March 21st. Submissions must be dropped off in Working Method no later than March 22nd by midnight. If you have any questions or concerns, please feel free to send an email.